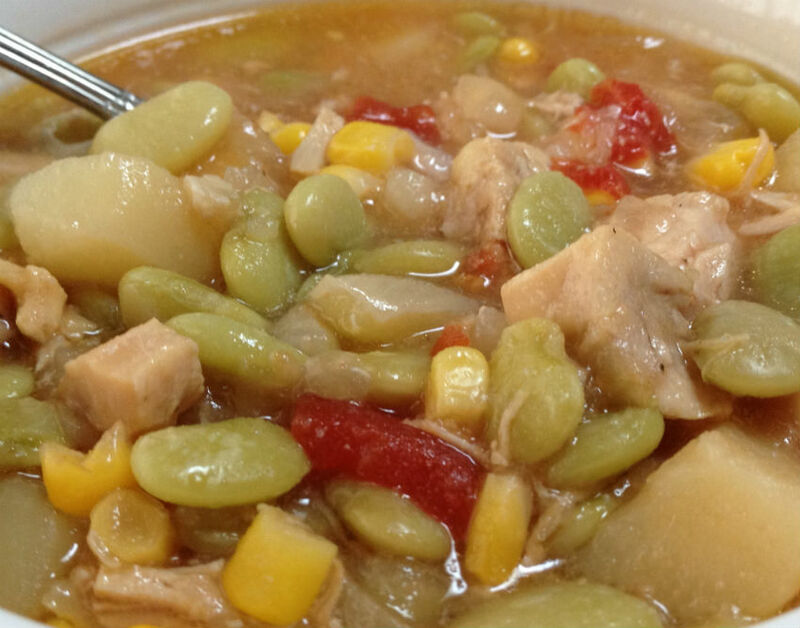 Brunswick Stew is one of my most popular recipes. It’s also one of my personal favorite soups made with chicken. It’s always on the menu during the winter months, but I love to keep some in the freezer to grab for an easy, filling meal any time of year. It is such a satisfying meal loaded with vegetables, chicken and a tasty broth. Usually Brunswick stew calls for pork, but we prefer chicken. You can make it a stew or soup, whichever you prefer. I like to keep it a bit soupier, especially when freezing. It’s easy to leave out some broth when serving if that sounds better on a particular night. Traditional, the Virginia classic would be found in a huge pot cooking outside over a fire. I imagine you would follow the aroma from afar when it was cooking. I use a slow cooker instead. 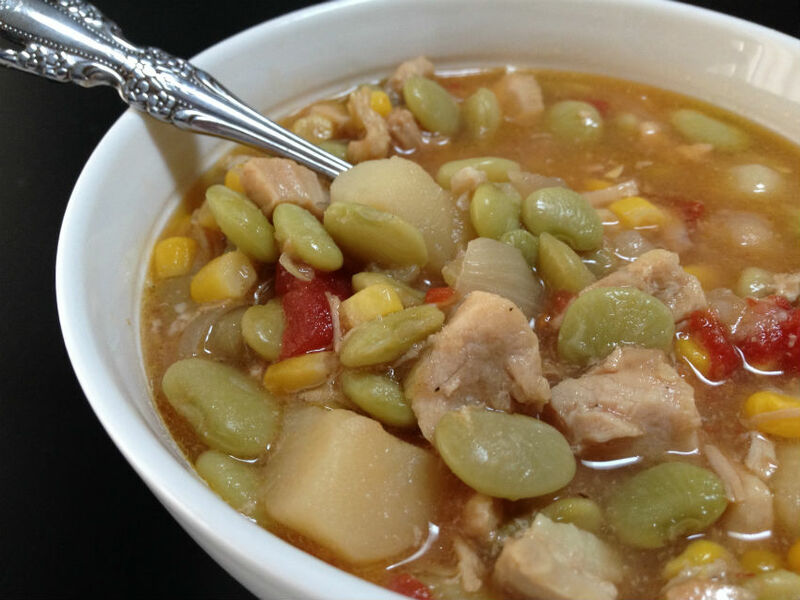 Soups and stews are so easy and so delicious in the crock pot, simmering the day away. The lima beans and corn add color and flavor. Chicken thighs stay nice and tender, and the potatoes add to its rich body. Canned or fresh chopped tomatoes flavor the delicious broth. It’s makes a very tasty comfort food that fills you up and makes you feel nice and warm inside. I’ll serve it with fresh made rolls or cornbread. That’s all you will need You’ll find it very satisfying, full of nutritious ingredients, and a dish so tasty your guest will be asking for seconds. Combine it with the oil in a large size slow cooker. Arrange the chicken in a single layer around the walls of the cooker for faster cooking. In a bowl or a baggie, sprinkle the onion and potato with the salt and pepper, mixing to coat, then add to crock pot. Add the bay leaf, a cup of the broth, the tomatoes, lima beans, corn, sugar and bouillon cube. Add in more broth to the thickness you like. It should be a little thinner than chili. Cover and cook 2 more hours, until potatoes are done. Each of these crock pot or slow cookers offers different features, each of which would be useful and appreciated! The more I read about each, the clearer my first choice became. Which would you choose? All are big, so they hold plenty. All have removable inserts for easy clean up. And All of them would be great choices in a Slow Cooker. The Snap and Seal lid on this Crock pot makes it a perfect choice if you attend events and parties that include potlucks. This basic Hamilton Beach cooker features a lid that will allow you to securely and transport it to a party or anywhere. It even has a carrying handle The porcelain insert removes too, for easy and thorough cleaning. You can even put it in the dishwasher, along with the lid. It’s a popular choice with over 700 ratings for an average of 4.5 stars. How about being able to program your crockpot the night before? How handy would it be to program your crock pot to cook? For a recipe like this one, for instance, you can program it to turn down to low after two hours on high. There are times when programmable might be important to you. It would also be nice for cooking steel cut oats for breakfast. This is the one on my wish list. Slow cook, brown and steam in this top-of-the-line slow cooker. Being able to brown a roast or meat in the same pot, then set it to slow cook, would be the winning feature to me. And…it’s programmable too. You can use it as a steamer besides. A product that has multi-uses always appeals to me. Add to all that the Cuisinart name, and you can see why it is on my wish list.